The Peace Poets are an arts organizing tour that will visit California Cities to share skills, build momentum, teach and popularize songs, make art to be used at Rise and beyond and support mobilizing for Sept 8 and beyond. The Peace Poets are a group of song leaders and trainers, songwriters of popular anthems for many social movements, and performance rap crew. The foremost grassroots movement song group in the United States, they will engage the audience, teach songs, and share their mix of singing, hip hop, and spoken word for a better world. The Peace Poets wrote “People Gonna Rise Like the Water” a popular anthem of climate justice and water protector movements. They wrote the song, “I Can’t Breathe,” about the death of Eric Garner. The actor Samuel Jackson heard the song, invited via Youtube celebrities and others to record their own versions of it, and it went viral, becoming an anthem of the Movement for Black Lives, widely sung in demonstrations. The Peace Poets have similarly worked with immigration rights, indigenous, and environmental justice groups to develop music as part of their political practice. Arts Organizers David Solnit (art.350.org) will travel with art supplies to screen print and paint flags and banners for each community to use in the Rise march as well as their ongoing work. At each city we will teach how to plan, coordinate, and paint a street mural, and actually design and paint one with our host groups. This will prepare each group or community to paint one on Sept 8th. Peace poets will teach songs to be sung in the streets and train song leaders with tips on how to lead songs and sound strong. A Tour visit to your community might include a ½ day arts-making and street mural training session, a song workshop for song leaders, and a performance by the Peace Poets, with a local speaker or performer talking about Rising for Climate Jobs and Justice. Support local cities and communities in reaching out, building participation and excitement, building organization, alliances and and powerfully mobilizing. Build the capacity, skills and resources for local climate justice related organizations, coalitions and communities in California. Place the arts at the center of our organizing, outreach and mobilization. Centering arts can powerfully tell our stories, reach our communities and win positive change. Help mix clay paint and prep supplies for the worlds largest street mural. Help screen print, paint and rig flags to fill the streets. Mosty working outdoors, so bring sun protection. WE NEED: LOTS of plastic yogurt style containers w lids, plastic lawn chairs that are not broken, but not new (don't buy). Pop up shade structures you don't need. Join the Art Builds for Climate Justice & a Better World Facebook Group to find out about upcoming art builds and workshops. Groups who will march on Sept 8 are encouraged to organize their own art builds to create strong visual art (great resources, downloads and how to’s here), to make the march powerful and beautiful and also to create art for your ongoing local campaigns. 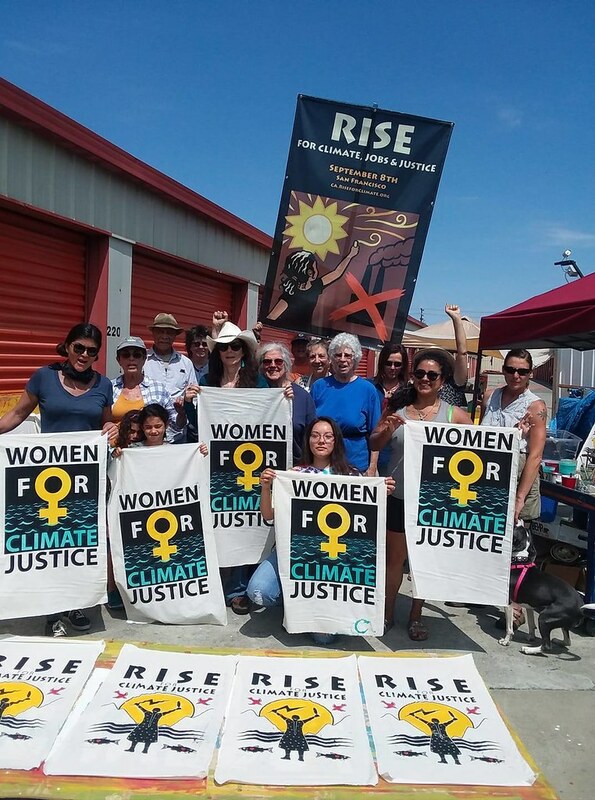 Rise for Climate Justice Mural Project is organizing a Mass Street Mural Mobilization on Sept 8 at the culmination of the march. Wear your painting clothes. We are planning to paint the world’s largest street mural using non-toxic temporary tempera and clay paints in conjunction with Rise for Climate Jobs and Justice, at Civic Center Plaza in San Francisco. We will involve dozens of organizations and community groups to paint over 50 mural sections and aim to involve thousands of people in a well coordinated effort. We want you to be part of this record breaking event! The mural project will be peaceful but will not request permission or a permit. We’ll do our best to fully inform participants of any risk, so everyone who needs to can stay safe. Watch these videos to see how all of the past street murals have been done successfully. Email climate.justice.street.murals@gmail.com to get involved! We are getting 50k people to sing together in a big unifying moment, read below for more! Our movements in these times need music and art to help propel them forward and create a beautiful, sustaining culture that motivates all involved, and energizes those observing from the sidelines or even those resisting. CONTACT musicriseforclimate@gmail.com with any questions and to join us! There are two singing groups you can join. Bands and individuals welcome. We are gathering hundreds of singers and choirs to “perform” one big vocal prayer. Join us to make this the largest choral flashmob for the climate ever! There will also opportunities for different choirs and musical groups to lead songs on the stage at Embarcadero Plaza just before the march kicks off, and to also song lead for different groups during the march. Before the march kicks off, we’ll sing “Rise for All Creation” at 10:45 on the Embarcadero Plaza “stage.” Meet at 10:20 behind the stage to rehearse! We’ll mark the beginning and end of the march by sharing a 50k person moment of silence then singing “Voice of my Great Granddaughter” at 11am and at 2pm wherever you are. We’ll share a moment of march-wide unity and song before we step off. The Song Team leaders will then spread throughout the march and Civic Center with all the amplification we can muster to lead these moments. We’ll take moment for everyone to stop painting, step back and see what we’ve created. A drone will take photos as we move and sing “Voice of Our Great Grandaughter”. Occupella invites everyone to sing with CURBSIDE CLIMATE CHORUS at the RISE for Climate Jobs & Justice March. We’ll meet at Montgomery & Market to serenade marchers as they pass by. We’ll supply songsheets and songleaders. Come for a song, come for the duration. There will be opportunities to continue singing after the march at Civic Center as the giant mural is painted! Please check the Occulpella website for updates. Many moving parts beyond our control may dictate some logistical changes. We’ve got a library of instructions that show you how to make stencil art, flags, banner and all kinds of mobilizing artwork. The complete guide to Rise art making. Downloads, how-to’s and more! Download some unique artwork from across the globe! Psd files available. Or submit your own artwork to share with others. Print these Paperhand artworks. Color in as you wish.